The ARIS Exam - Get certified! 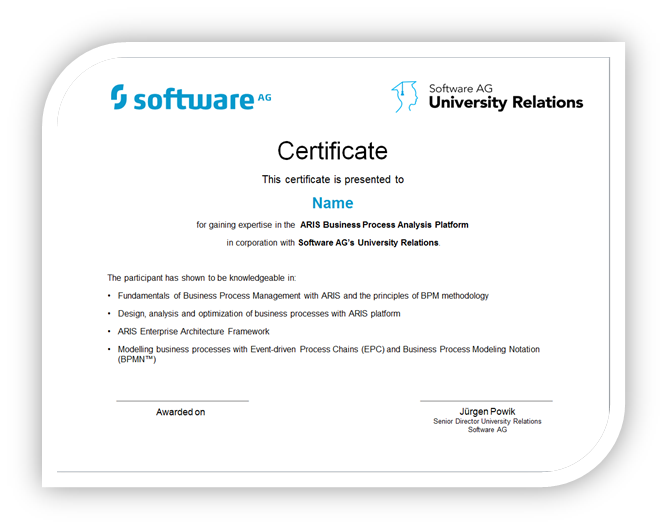 Get proof of your ARIS & Business Process Management (BPM) skillset by earning your ARIS Certificate. Master a new body of knowledge. Put it to use as soon as you can! Don’t forget to include your new skills on your social networks (e.g. LinkedIn, XING, etc.). We recommend using the keywords “Business Process Management” and “ARIS”. We also recommend you to study our tutorials, before you attempt the exam.